Album cover artwork by Emma Spooner. Creepy crawly insects, childhood nostalgia, and really good indie rock music your thing? Of course they are, so read on. The catchy and unique “Caterpillar Killer” is also the title of the eighth (and best) song in the album, in which Spooner sings about a pet caterpillar that she kept in a jar as a seven-year-old. Apparently, she didn’t pay enough attention during the elementary school butterfly unit. The beginning of “Caterpillar Killer” starts off soft and acoustic and then dives into a crunching electric guitar chorus. In the words of Spooner, “the whole song is kind of … about growing up, but kind of not wanting to, but just being confused about it,” a sentiment expressed in most of her other songs in the album as well. So if you know Spooner personally, you’ll definitely find a lot of her personality in the lyrics. Also, bugs. 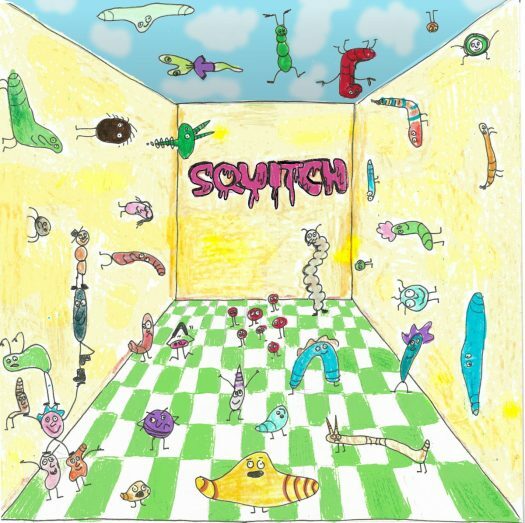 Like most iconic band names, there is no underlying, profound meaning behind “Squitch”. The word itself was created rather spontaneously by Spooner and her friend, Eve Worobel, another student at Exeter. “It’s mostly just a sound … It’s actually kind of weird. My friend Eve and I randomly started saying ‘squitch’ instead of ‘squish’ and … replacing a lot of ‘ish’ sounds with ‘itch’,” she explained. “So we just started doing that and then Denzil was like, ‘hey, that’s a cool band name’”. It was agreed upon that many parts of the album definitely have a “Strokes” vibe, but some of her other influences include indie bands and singers such as “Pixies,” “Palehound,” “Bully,” “Frankie Cosmos,” “Porches,” “Courtney Barnett,” and “Angel Olsen.” If you happen to be a fan of any of these slightly obscure composers, then that’s another reason to go check out her album. Spooner was also asked if there were any political messages in any of her lyrics. Not having been prepared for this question, her answer was a surprisingly good one. But she also wanted her audience to know that “everything [expressed in her music] is not exactly true to [her] life because it’s art … and exaggerated because it’s made to be what [she wants] it to be,” which is something common among artists. Lastly, Spooner named her favorite songs in the album as “Itchy People” and “Caterpillar Killer”. “I’m just really proud of those songs,” she said. “‘Itchy People’ is just really gross. The lyrics are just disgusting and I really like that … and [the chorus of] ‘Caterpillar Killer’ just hits you so hard and I’m really proud of that. And I also like ‘Hi Five’ because it’s nice and grungy and makes me head-bang really hard”. Spooner doesn’t plan to end her musical career any time soon, so we will likely see more great albums like “Caterpillar Killer” released in the future. She’ll also be performing live in Boston, so keep an eye out for dates released on Instagram (squitch_bugs) and Twitter! “Listen to me,” said Spooner, in response to the any-last-words question.